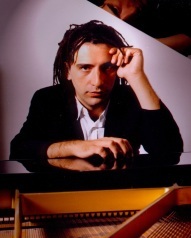 Italian pianist Stefano Bollani was born in 1972 and turned professional when he was 15 years old. He has been a regular member of the group led by legendary trumpet player Enrico Rava. Besides being a terrific pianist, he is also known for his singing and comic talent. As pianist, Bollani's techniques are very solid. Imaginative and unpredictable, his playing can take you from the most lyrical and swinging four-beat jazz to far-out free improvisazion in a matter of seconds. Bollani was introduced to Japanese audience by an independent jazz label Venus Records, and he has since recorded four albums for producer Tetsuo Hara. Bollani's take on the works of great Brazillian composer Antonio Carlos Jobim, Falando De Amor, is one of my all-time favorite piano trio albums.